Although digital camera phones have taken over in popularity that hasn't stopped the production or professional use of dedicated camera equipment. 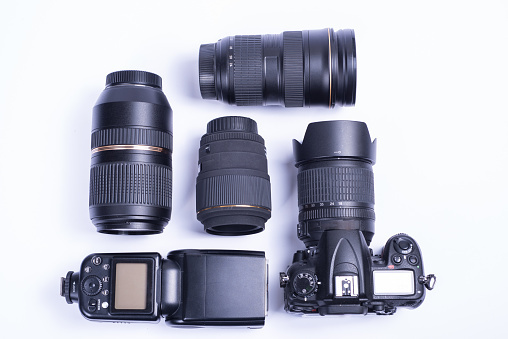 Photographers and studios still have a lot of very expensive equipment including cameras and lenses. It's important to keep track of all these valuable assets. This is why Dantech offers an extensive range of asset label solutions to meet the requirements of photographers and studios. 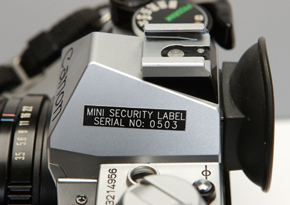 Label materials suitable for asset marking cameras and lenses range from inexpensive vinyl through to durable materials such as aluminium foils and polyesters. It's good to consider the items long-term wear and tear and choose an asset label material that can withstand regular handling from a reputable supplier. This is because cheaper labels many fall off or be easier to remove. The ID MINI MARK asset labels from Dantech are great for photographic equipment. These are tiny labels (some 9mm diam) which have the text engraved into the surface of the label material (text won't rub off) will withstand most cleaning materials and chemicals. In addition asset labelling it makes sense to also have an asset register. An asset register is not just a question of being able to see who last had a particular piece of equipment, but also so that if there is a theft or fire there is a definite list that will satisfy the insurance company. Using asset labels with an asset register can help you keep records of the condition, repairs, and maintenance - and also discourage ‘asset misappropriation', theft and fraud. For more information call Dantech on 01354 688 488 or you can order online at our ID Security Marking or Express Labels websites.